Whether you need a small one-man tent or a product big enough for the whole family, there are some brands that come through every time. On the flip side, there are others we should be avoiding. For this reason, we’ve decided to compile a list of the best tent brands in the UK! 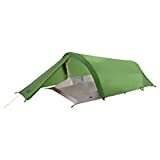 As an affordable brand, Coleman tents are ideal if you don’t have the money for a premium option or if you can’t justify the big investment. With everything from one-person to six-person tents, this is a great place to start your search. Based in Germany, Skandika is very much focused on the family tent market so offers plenty of large tents. In fact, they have a 12-berth pod-style tent that’s bound to grab the attention as you scan the market. With affordable pricing and German efficiency in design, many in the UK are turning to this brand. As an anagram of the company’s home town in Glasgow, Govan, Vango tents actually belongs to the AMG Group now and is seen as the largest tent brand in the UK. With over five decades of experience, their innovation through the years has brought them to the top of the market; this innovation includes inflatable-tube tents which they brought to the market before anyone else. Born and raised in the UK, Kampa in known primarily for their awnings for motorhomes and caravans. 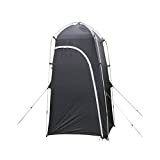 However, they’ve diversified into tents in recent years and specifically specialized tents with options of air-tube tents and poled tents available. 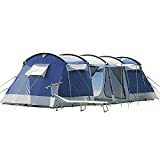 Possibly the leader in the market for family tents, they offer great models if you go regularly because the larger investment becomes more worthwhile. 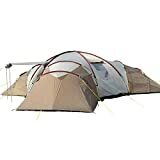 Although they dabble in the lower-end of the market, value for money is found in the larger tents and all their features. After starting in 1975, this brand has reduced its portfolio in recent years but still offers everything from two-person backpacking tents to ten-berth tents; interestingly, they’re now owned by Sports Direct. As a family-run company in Scotland, the range of tents from Highlander is always increasing. However, they choose affordable tents that serve a purpose without the unnecessary bells and whistles. 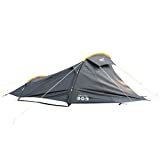 Known for its outdoor clothing, this German brand likes to supply technical tents for those who want to challenge themselves while backpacking or completing an expedition. This being said, they also offer some family options too. Belonging to Go Outdoors, Hi Gear is the range of tents belonging to the brand and they tend to stick to family tents. Around the mid-range market, they like the tunnel style but can accommodate other needs in their range. We’ve taken a trip around Europe today and we land in France for Caranex and the supplier of a wide array of tents and tent-related products. Utilizing various materials, their durable nature leads to a higher price tag but they’re certainly worth your time if you can stretch for the investment. Boasting the largest tent manufacturing plant in the Netherlands, this Dutch company has a history dating back nearly 100 years and their traditional designs have captured the imaginations of many Brits recently. As a Halfords brand, the options are limited but they’re also high-quality. 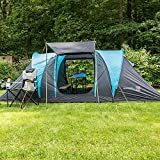 With attractive pricing, many people last year took advantage of a certain deal which saw a four-berth tent sell for under £100 despite coming with sleeping bags and other extras. After being in business for over a decade now, this manufacturer of Bell Tents has found its niche in unbleached cotton canvas but they also like to test traditional materials for interesting end products.